Join the CrossFit Preferred Team for the Spartan Sprint Race February 9th at 10:30am! We have a great team and it is going to be such a fun time! This will push you in your training the next couple weeks! It is a 3-4 mile race with obstacles and we can prepare you for this race no matter what shape you are in right now! We have a Spartan Class on Monday and Wednesday at 7:00pm and Saturdays at 7:00am – Coached by Spartan SGX Coach Andrew Lucero! 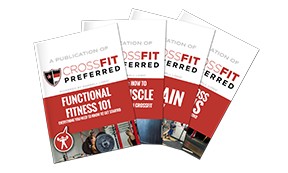 We have created a CrossFit Preferred Team! We are racing the Sprint Race Saturday February 9th at 10:30am. Join us!! Complete 500 Strict Pull Ups (no Kipping or Butterfly Pull Ups) in the month of January! If you do 25 Pull Ups 5 days per week you will hit 500 Pull Ups. If you do not have a Strict Pull Up start where you are at and do Ring Rows, Bar Holds, Negative Jumping Pull Ups or Australian Pull Ups. 3×200 meters with 2 minutes rest between reps.
Take more rest as needed for full recovery. 60 Minute Easy Run or join us at CrossFit Preferred for a CrossFit workout! Very important to get time on your feet and build an aerobic base in your running. Discuss the distance with Andrew or Kris to come up with a plan! Rest Day – This is a great day to relax, stretch, foam roll, sleep extra, take a nap, read and recharge for the next week! Simply choose your experience level and get registered for CrossFit Preferred today!